The Sky Sports SkyPad has become an essential sports punditry tool but what is this mysterious giant tablet, and how does it work? The legendary SkyPad has become a fixture of the channel's punditry over the last couple of years, with Gary Neville championing the technology and was rumoured to have one in his house. Neville's mastery of the “big tablet” has led to a roll out across other sports, most recently for Sky's Ashes coverage, which saw the SkyPad attached to a golf buggy, so it could be driven onto the pitch. But what powers this mysterious tablet? Is it just a pre-recorded video with expert miming? Or is it really the world's biggest tablet? Read on as T3 gets an exclusive behind-the-scenes look at the Monday Night Football studio and a hands-on review of football's hottest gadget. While the SkyPad moniker suggests that Gary Neville's beloved tablet is an integrated all-in-one device, the reality is a mass of wires and it's a lot bigger than it looks on TV. The SkyPad's screen is actually a 70-inch (176cm) Sharp PN-L702B display, with integrated touchscreen. It weighs a colossal 70kg, so it's not exactly man-bag friendly. If you're sizing the SkyPad up for your living room you'll be disappointed. You'll need a house the size of a Premier League footballer's with a wall big enough to house the 164cm x 98cm panel. It's not slim either; the 12cm depth means it's around six times thicker than your average Ultrabook. What's more, the SkyPad is totally bespoke. There's no single box you can buy and even Neville was only allowed to borrow one for eight days. Believe it or not, the SkyPad shuns iOS, Android or Linux in favour of a Windows operating system. The software is outsourced to third party developers who tweak the features and settings for the individual needs of each sport. Therefore, football, cricket and F1 have completely different features. The tools available on Monday Night Football are player markers, magnifiers, arrows which can be set via waypoints, shaded boxes and a tool which can select players and move their position. These tools are located in each corner and you tap to turn on the tool, then tap to apply it on-screen. For the 2013/14 season, the tools have been duplicated on both sides of the SkyPad ready for Jamie Carragher's debut on the show this year. The screen itself is a 1080i 1,920 x 1,080 panel with a contrast ratio of 3000:1, with a 6ms response time which is actually about average for a modern touchscreen monitor. It's daubed in a non-reflective coating which looks great on TV, but actually makes the screen look duller than Alan Hanson's wardrobe. When you get up close even the full HD resolution stretched across giant 70-inch panel means the picture is slightly pixelated. It suffers from Gervinho's lack of sharpness up close, albeit, it's slightly better looking. While the SkyPad renders its software in 1,920 x 1,080, the video pane where clips are played back is also rendered in HD separately. It takes footage from an “EVS” server, where all football footage is stored digitally. That ensures the SkyPad displays footage in the best possible quality. To ensure flicker-less playback on TV, the camera positioned above the SkyPad has its frequency reduced. There's no exact science here, but 51hz is roughly the right level. Despite the SkyPad being a Windows PC in all but name, there's no hint of an Intel Core processor in sight. In fact, there's no processor or box on the studio floor whatsoever, and the grunt is handled by two server racks filled with 10 HP X820 processors and stacks of Bluefish video cards. Using the SkyPad is easy and the interface is simple enough that even Kyle Walker could get to grips with it. The only problem is remembering which tools require dragging; that gesture is supported but isn't used for obvious functions like drawing square boxes. Generally the SkyPad is responsive and slick to use, but the matte coating does make extensive travel when dragging the arrow tough. Your finger can easily skip across the surface when dragging an arrow, which would look pretty embarrassing live on TV, so we hope Jamie and G-Nev have got plenty of practice. Battery life is extremely poor, given the SkyPad's total reliance on the mains, however portability woes don't end there. It's also impossible to transport, not just because of its 70kg weight so inventive solutions will have to be used in order to play Angry Birds on your commute. Copying Sky's cricket coverage would be the best idea, using a converted golf buggy to drive the SkyPad out onto the field. Overall, the SkyPad is an excellent tool, although it's impossible to rival the likes of the iPad 4 or Sony Xperia Tablet Z for portability. While the iPad weighs 650g, the SkyPad's 7000g makes it hard to recommend. 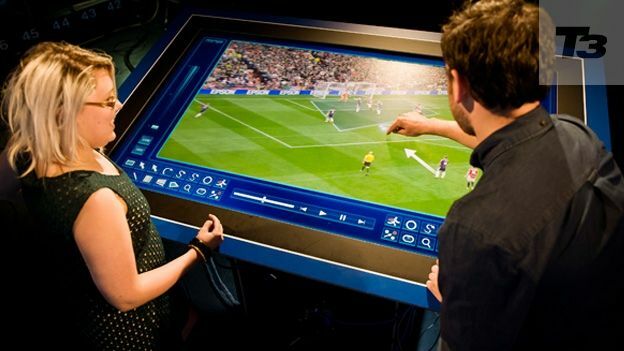 However, it's easy to use, wonderfully designed, and extremely powerful, and is one of the highlights of the fantastic tech which viewers can enjoy in the 2013/14 Premier League season. WATCH the Sky Sports SkyPad in action in our exclusive video below.